Nose shaping operations have become the most common aesthetic and functional surgeries. Patients coming from many different countries now have nose esthetics in Istanbul. Below, nose forming operations can be summarized as follows. The following operations and procedures have been described for shaping the nasal tip. Nose tip aesthetics (or tip plasty) are made only for shaping the end part (nose tip section) of the nose. It can be done under general and local anesthesia with open or closed technique. Buffer, splint and bandage can be used without. Nose tip aesthetics prices vary according to the size of the procedure, materials used and hospitals. Nose tipplasty nose tip aesthetics prices are lower than nasal aesthetics operations. Nose aesthetic centers. Nose tip aesthetics and nose plastic surgery are performed very often. Nose aesthetic price and nasal tip surgery prices vary according to the technique, operation time, blood tests, materials and standard operating package prices specific to hospitals. Nasal surgery prices are much more economical in Istanbul than from many international countries. Therefore, many patients planning to come for nose tip aesthetics to our country. By using permanent suture materials, the tip of the nose can be hung upwards. This method is known as "nose-hanging surgery". In this way, the tip of the nose can be made more visible. It is very unlikely that the tip of the nose will be directed upwards with only one rope. Generally, the thrown rope can loosen spontaneously, over time, or due to a simple trauma. There are many patients in the skin of the nose that are removed from the nasal skin with reaction, discoloration and darkening. The rope is usually lower than the nasal tip removal prices, nasal aesthetic surgery prices and other nasal surgery prices. It can be done in policlinic conditions. Some physicians avoid practicing because the method is persistent and may cause persistent reactions in the skin. The fact that the rope-nose prices are reasonable and that the method is advertised as a practical, effective method leads to the intense interest of patients. is a method I don't prefer much to because it is temporary and there are sewing reactions due to permanent sewing materials. Nasal filler procedures can be done by using different dermal filler materials such as permanent and temporary. It is the process of forming a nose tip which is very common in the Far East. Permanent fillers may cause necrosis, ulceration, allergic reaction, gangrene and nodule formation. Although temporary and absorbed fillings are used; serious and permanent tissue loss after intravenous infiltration. The methods of nasal shaping using nail or botox have been popularized in recent years, called "medical rhinoplasty" or "non-surgical rhinoplasty". Cross linked hyaluronic acid fillers are used very frequently in the world because of less reaction risk and safer content. Temporary paralysis of the muscles, which pulls the nose tip down with botox injection and causes the wings of the wings to open sideways, provides a steeper view at the tip of the nose. In the same way, it is temporary and must be repeated after 6 months. In our day, as in the past, "artificial", "tightening nose", "plastic nose," such as unnatural nose aesthetics instead; the idea of ​​"natural nose aesthetics" is dominant. Ideal aesthetic nose models are generally models in which an attractive, proportional and breathable nose is formed on the face of the person, depending on the mouth, nose and face dimensions. After nasal aesthetic surgery, the buffer may not be used or the self-soluble material may be used. You can find the answer to the question ın how to make a nose surgery un, which is a frequently asked question by the patients, on the website www.burun-estetigi-rinoplasti.com Nose surgery is used for aesthetic and non-aesthetic operations. Nasal aesthetic surgery is a specially designed operation consisting of several modified techniques. In the same way, nasal aesthetics are performed according to different rates in men and women. In men, a flat and non-cavernous nose is preferred; women may be more curved (although personalized) and a more nose-shaped nose tip may be preferred. "The best doctor in nose aesthetics" can be defined as the most natural, the most functional and the most suitable doctor. It is also stated that physicians who are selected as ları the best nose surgery doctor ır by surveys abroad also have the most knowledgeable and compatible patients about nasal aesthetics. It is important to observe the psychiatric analysis of the patient before the operation and the patient's objective expectations. For example, in patients with manic-depressive (bipolar) disorder, obsessive-compulsive disorder, who believe that rhinoplasty can correct all problems in his / her social life (thinking like "that my marriage is saved by this surgery") post-operative disappointments may occur in patients who feel like. Nasal aesthetic surgery results can not be shown in advance. The amount of healing tissues of the patient, the postoperative care of the patient and the amount of nasal deformities present before the surgery also affect the result after the nose aesthetics. In advanced trapezoidal noses, in patients with "nose" C, previous nasal surgery or severe nasal trauma, there is a possibility of post-operative disorientation or asymmetry. Roughly this can be explained by the fact that "natural materials found in the patient's nose are more or less trapezoidal." 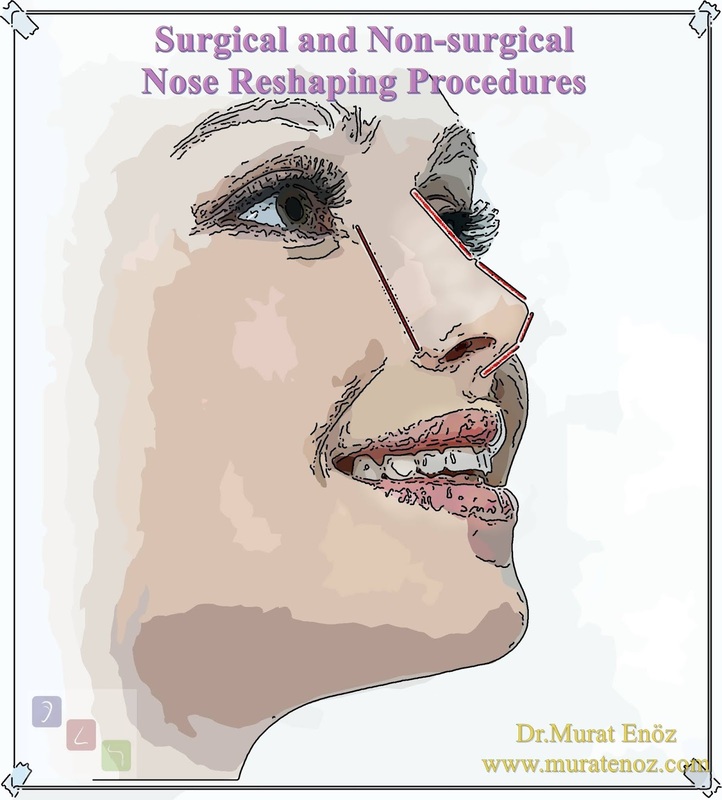 Each time, there are many patients who are trying to perform surgery to reach the shape of the nose planned on his mind and who are unhappy, and who take risks of infection and collapse as nasal aesthetic surgeries are repeated again and again. It is very important that the physician understands the patient expectations and agrees with the current problems. Excessive and unnecessary removal or replacement of cartilage tissues can lead to permanent problems. Nose aesthetics should be planned according to the proportions of your face. Although it is a very expensive group of transactions, especially in Europe; Nasal aesthetics prices are generally lower in Istanbul. Even in non-aesthetic nose operations for private insured patients; If there is no special additional policy requirement, nasal surgery operations are not covered. Nasal aesthetics may vary depending on the operation prices, hospitalization, processing time and materials used. Nasal aesthetics price can be changed when septoplasty surgery, turbinate radiofrequency and endoscopic sinusitis surgery are performed. There is no significant difference between. Nose aesthetics is not a procedure that can be done in a hurry and without a care. As well as the sterilization of the instruments used, it is important to use protective methods that minimize tissue damage. How each individual's facial structure is different; It is also important that care should be taken in such a way that the shape of the nose is likewise adapted to this facial structure. The "10 Shocking Celebrity Nose Jobs You Didn't Know About" link contains 10 pre- and post-operative views of 10 famous names. In this link, you can also see articles about celebrities that have been made in the old years and have been over-resected. A frequently asked question is "what is the age limit of nose aesthetics?" The answer to the problem is "the largest age limit for nose aesthetics; the smallest age limit is the age of 18 years of development." After aesthetic nose surgery, usually after the first two weeks, many complaints such as facial edema, nosebleed or nasal obstruction disappear. Open technique rhnoplasty may be appropriate, especially in noses with severe septum deviation and high deformity; It may be preferred according to the experience and knowledge of the surgeon. Although anatomical details can be seen in detail, this aesthetic nose surgery method can be performed under general and local anesthesia. Local anesthesia is not preferred for nasal aesthetics and is usually performed under general anesthesia. In the closed technique nose aesthetics, nasal tissues mimic dissection is performed. In this way, it is aimed to minimize postoperative edema and pain. However, it is not possible to see the anatomical details of open technique. The technique of nasal aesthetic recovery and technical selection of other nose operations can be performed. The choice of open or closed technique can be selected according to the patient's nose type and the amount of deformity present. Non-surgical rhinoplasties are nose filler and botox applications. It is usually called medical rhinoplasty", "medical nose aesthetics", "non-surgical nasal aesthetic", which require temporary and repetitive application. Under the name "nose reshaping devices", different products and apparatus are sold in the market. There is not enough scientific evidence to use these products. These products are designed to mold only the nostril tip and have any effect on the nasal bone. Especially in the far east, where there is a wide and churned nose-tip appearance, females have intense interest in such non-operative nose-shaping apparatuses.